When I had my daughter, just like any Indian woman, I knew panjeeri was on it’s way. The nutritionist and the mom in me was ready to eat anything to make my milk better for baby. The plus was that I loved the taste and it was going to help me recover, clear out the postpartum ‘stuff’ and be energized without having to worry about meals for herself. See panjeeri is a traditional Indian food that is known for its nutrient density and qualities. I didn’t care much before I was consuming it, but sure enough I quickly did my homework. Here is what I learned and my version of panjeeri that I still enjoy every winter(yes it can be healthy, gluten free, vegan and even paleo). It’s a delicious treat and truly a savior many mornings, when I need something but have zero time and I swear it fuels my ambitious levels of productivity. I call it a breakfast hack for me (and the family) and clearly the generations before us did well with it too. Only a little bit at a time – usually 2-3 tablespoons is enough to satisfy one, if you eat 4-5 tablespoons your likely not hungry for a good 4 to 5 hours. Post-Partum: This version made for the new mother contains various herbs and foods to help cleanse post delivery, boost recovery and milk production and keep the mother fueled when she may not have time to prepare meals for herself. Back Injury/Physical Recovery: Given the high fat and mineral content (including calcium from the nuts) it is extremely beneficial to our bones, cartilage and muscles when we have experienced strains and sprains. Superfoods added are focused on warming the body to get blood flowing to the injured site. Winter Stamina: In northern India the crops are limited and the temperatures get quite low. 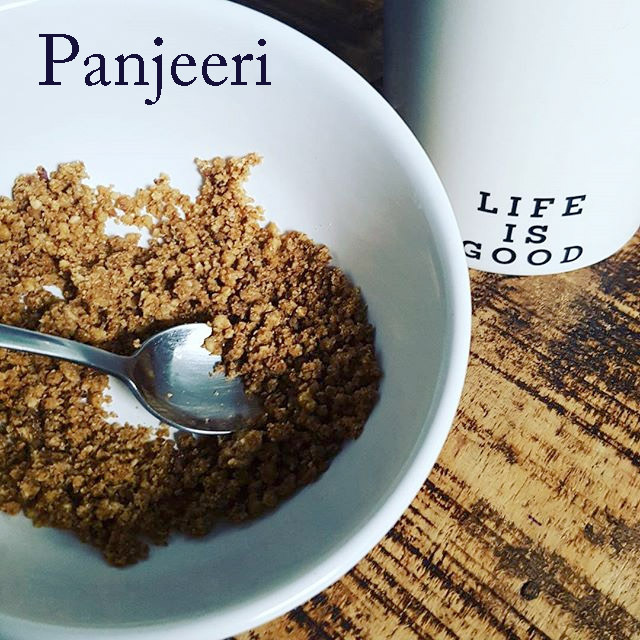 The nutritional content of panjeeri provides the essentials of maintenance during this period, along with focusing on density when abundance is low. Warming herbs are used to help increase stamina and energy. Weddings & General Snacks: Panjeeri is often made during times of celebration, such as weddings, or to have as a snack. These variations have little to none of the superfoods, but are more of a treat. They do include the nuts and seeds hence remain high in fat. Kamarkas (Butea monosperma, butea Frondosa) – Bitter herb used as a muscle tonic for low back pain and pelvic/uterine muscle toning. Also has anti-depressant and anti-inflammatory properties. Soondh (Dried ground ginger) – Warming herb that protects the immune system. Dried is different than fresh, but still carries anti-inflammatory benefits. Note that these are always ground before adding in. Kamarkas, Phool Makana, and Char Gond are always cooked and then ground before adding. Amount varies from 2 to 5 tablespoons, with ground ginger and methe and gum arabic being the lowest in volume. Get the ingredients and chopper out to be effective with your time you can chop during the time the flour is cooking. Fry the kamarkas on medium for approximately 10 minutes and cool before grinding – this may require a coffee grinder for a fine grind. Be sure to let the base cool down before you add in the nuts and seeds. Fold in all remaining ingredients in the large pot with the base. Let cool and store in glass containers for up to 2 months in cool area.